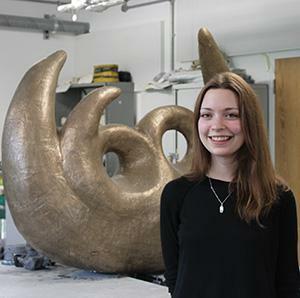 Lauren was selected to work in collaboration with The Reigate Society to commemorate its 60th Anniversary with a permanent sculpture in Reigate Priory Park. Her winning design was selected from over 50 students from local schools and colleges; it is currently being made and will be unveiled in the Park later this year. Lauren completed her Art Foundation year in June 2013 and has since progressed onto the HND Graphic Design and Illustration course at the College. "I would recommend the Art Foundation at Reigate School of Art as it gives you the opportunity to try out a range of subjects, learn new skills and work on live projects"